Flying over Salama I don't see much that gives me hope for the survival of cheetahs in Kenya, and yet... During my first visit here more than five years ago the countryside was much more homogeneous, more regular. But the big ranches are disappearing little by little, subdivided by the government, taken over illegally by more and more people searching for new land. Where are the gigantic Euphorbia that I loved to perch on just a few months ago? Cut, like so many other trees. The Mombasa Highway that cuts through this area is used more frequently since it has been improved and the excessive speed of the cars and trucks that take it make it even more of a hazard. On top of that, the rapid construction of the Malili Technopolis has reduced wildlife habitat. According to my hardworking friends at Action for Cheetahs in Kenya, who continue their satellite following of the local population, during the past few months, sadly, many cheetahs have been killed while trying to cross the road. The situation is not much better for the people living here. Drought, like in the entire Horn of Africa, has ravaged a land already weakened by irregular rainfall. Poor water management, increased mono-culture and deforestation do not offer much opportunity to fight the chronic water shortage. Then why believe in the survival of cheetahs here? Personally, looking at it from my height of a few centimeters, I think that Man's future and that of these beautiful felines are very closely linked to Salama. The disappearance of cheetahs does not bode well for the local community. It signifies an irreparable damage to the eco-system, with even more soil erosion, a lack of water and progressive desertification. Problems insupportable for families already stricken by difficult conditions. 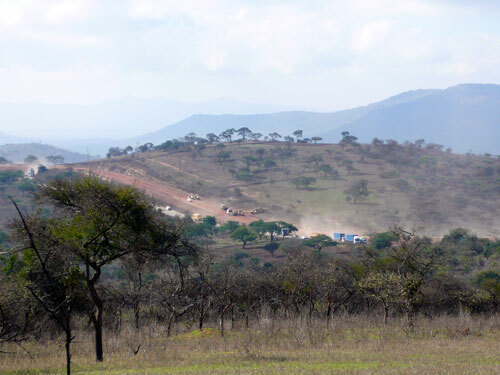 For cheetahs, if the "Battle of Salama" is lost, their habitat will be further reduced, hill by hill. A scenario that has already been played out in Northern Kenya where people can name the date that the last cheetah was seen. For an animal like the cheetah that can not survive only in national parks because of competition from other predators, it is a race against the clock to stop them from disappearing altogether in Kenya. That race starts here, in Salama. We must hope that Salama will be able to keep it's role as an ecological corridor and that the children in this quickly evolving region will have the will and assistance necessary to take control of their destiny, here where their parents have failed. We have discussed several possible solutions with the people here, but it is necessary to fight if they are to become a reality and turn against the destructive tendency that reigns. My cheetah friends confirm that their life in Salama is very stressful and the situation is critical, especially with young to raise. This morning I left one of my little orange feathers next to the youngest cub, Tumaini ("Hope" in Swahili). He played with it and then it floated away, far, towards the people, like a secret message, a SOS. At the Ifaty tournament in Madagascar, a photo alone can summarize the spirit of the Eco-Sys Action Football Cup (EAFC). 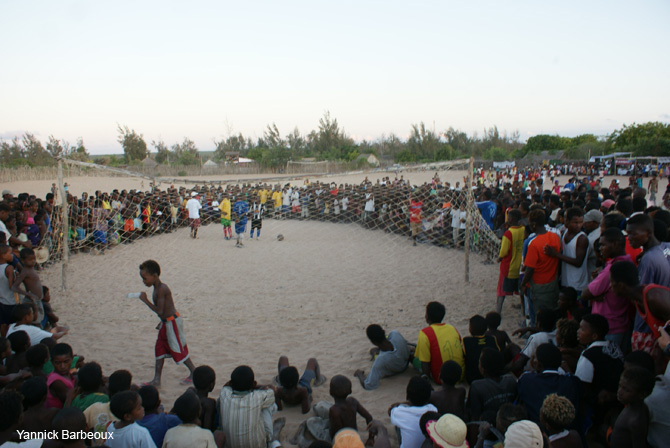 An unusual penalty shootout; the spectators form an almost perfect circle around the goal and the players, united by the same emotion on this “football planet”; the fervor mounts, the final will be determined by the final goal; the player will soon approach in the burning hot sand, the ball will fly, too high, too long, he will miss the target; but it is not important, it is the beauty of the sport in a cliché, the victory goes to the tortoises and nature, the weekend, perhaps more. Today, there are only winners. Eco-Sys Action started a portion of its pledge to UNEP Billion Tree Campaign by planting 1,000 trees in the Salama area in Kenya. This is a preliminary operation to test the soil and sensibilize kids to their environment. As Mary Wykstra, Cheetah Conservation Fund Kenya Director, says, "It helps communities understand that the environment which supports carnivores is the same environment which sustains the livelihood of the people." 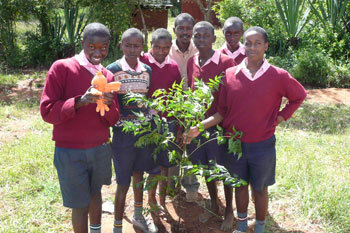 Four schools were selected in the Salama area and each tree is taken care by a group of students. A presentation on trees and the environment was given to them by a botanical specialist while an educational program was set up to help them understand the role of predators in the ecosystem. Indigenous Acacia sp., Lucena, Cassia saimea, Balanites sp. and decorative Neem and Jacaranda were among the species planted. The project will expand to set up tree nurseries and a similar action in the Samburu area with the Ewaso Lions Project. More than tree planting, it's the awareness raised by every single tree that makes this Salama project with kids so special. About 1,000 more trees have also been planted at two cattle dips where CCF initiated a campaign to improve livestock health and therefore show farmers the benefits brought about by preserving cheetah habitat. Because land divisions in the last 20 years have caused deforestation and reduced water supplies in this area, new trees and the ongoing program to reforest part of this ecosystem have given hope for a better future for both the community and the wildlife. Eco-Sys Action pledged to plant 100,000 trees to support the "Billion Trees Campaign" launched by UNEP under the patronage of Prince Albert II of Monaco and Nobel Peace Prize winnerWangari Maathai. The Eco-Sys Action project will not only involve tree planting, but will also include establishing nurseries and a sustainable medicinal plant microbusiness to ensure long-term benefits for the local communities involved. Most of the planting will take place in Kenya around cheetah habitat. See more. Eco-Sys Action joined a field trip organized by WWF to visit an FSC-managed forest (see www.fsc.org) in the state of Perak in Northern Malaysia at the border with Thailand. From a guided walk in the forest to a visit to a furniture factory, the trip encompassed the several stages of a tree from the forest to our home and workshops focused on how the FSC label helps forests to avoid being cut. After such a tour, you can never look at wooden furniture the same way again. The visit also took us to an orang asli (a forest tribe) settlement which shows how cultures and the fragile balance of the forest and its inhabitants can disappear with the chainsaw. Eco-Sys Action is a founding member of the China Forest Trade Network.